Fall 2017. Survival/strategy point and click video game. Developed in collaboration with Xavier Apostol. In Parahistory, history is only a distraction. Interpret your way through a variety of artifacts from a culture long lost, while managing the existential crisis of your own people. My Roles. Game/Narrative Design: I defined mechanics and narrative, focusing on world building. Visual Design: I headed all visual aspects of the project, including overall look, animations and UI art. Fascinated by the idea of deception and lying in video games, as well as how often they fail to be perceived as more than bugs or glitches, our group set out to develop a satirical game where these strategies are the core of one's experience. 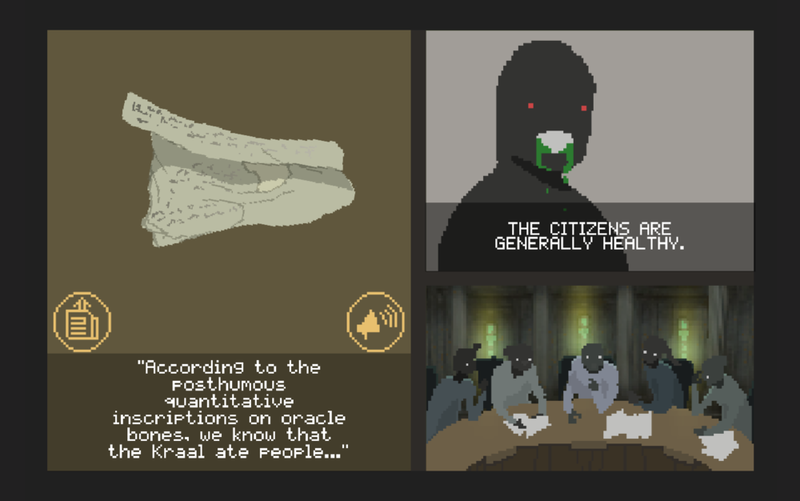 Parahistory is set in a fictional world with heightening environmental concerns, where the player takes up the role of the Historian ("the False Prophet") and is tasked with setting the course of development for the society and bringing solace to their people. • To explore manipulations of the truth within history. We wanted to scrutinize the proverb ("History is written by the victors") by presenting the player as one who had already won. • To have the player have to manage their deceptions. We wanted for the player's fictionalized narrative to become increasingly convoluted and to challenge them in tracking their deceptions, as they ultimately affect their survival chances. • To respond to politics of nostalgia and past greatness. To examine how these are capitalized on and construed to capture the imaginations of communities. Parahistory has a two-part structure: the player can choose from artifacts that cover various aspects of community life, and then they can announce their findings. Their choices branch off into new artifacts that are related to their inquiry. The effects of the player's choices become visually apparent, promptly. 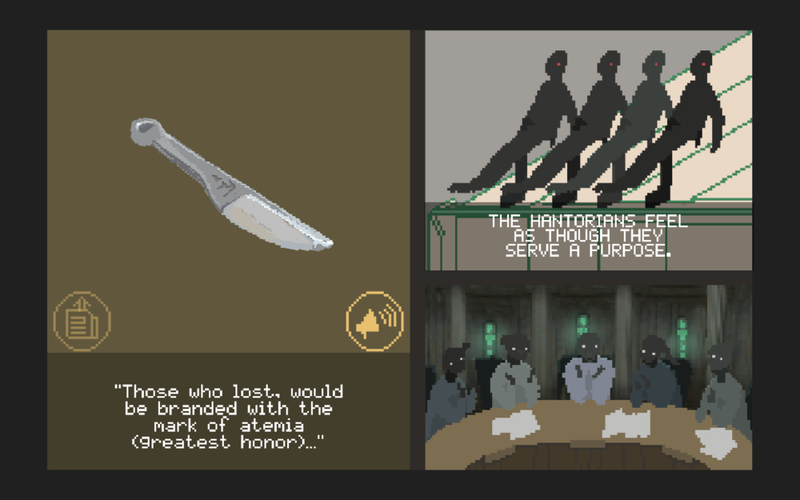 Taking inspiration from Reigns, Parahistory similarly marries resource-based mechanics back to soft systems and narrative at large. Playtesters noted enjoying the cryptic nature of the game, but also wanting a better understanding of how their choices affected its progression.